We at 88Problems thinks that almost one time in the life of everyone that love playing videogames, there is that moment when you realize : " OMG! I' VE TO CREATE A VIDEOGAME!!!" and obviously your idea seems to be te best you ever heard. Then you spent hours, days, months, years, age, era just to decide wich kind of game you must create, and the other rest of your life spending in founding an appropiate name. In all my life, I can count almost I tried 10 times to create something playable to the others, mostly on pc. At the beginning is all fabulous, like : "OMG, THE CHARACTER MOVES" or "WTF, THE ENEMY DOESN'T DIE". And then, after years and years passed playing videogames on the 80% of the human known platform, i' ve the same problem. Every time I try to add something to my script, it's like "WTF, Y THIS DT WURK?". You grew up, you learn, you do mistake, and as for the real life, when you began to write a videogame, you dont' have any freaking idea of what are you doing ( at least for me ). You think something, and then you realize that exist thousand clone of what are you thinking. Then seems to be the best idea in the world, you will be freaking rich, villas, sporting car, exclusive clubs... and once you sit on your chair and start programming.... just " PUUFFFF!" everything disapparead. That's because your idea wasn't soooooo original, and maybe it's too complicated. BUT, because there is a "BUT" everywhere, programming isn't ever a pain. You will discover another you, you discover the creative parts that is hidden inside you. It's just all in the beginning. You need a clear idea of what you want, sit, code and run. Then, everything comes trough. Story, character, map, visual effect... it's not about your game, IT's ABOUT YOU. Unleash what is inside you, code, code and code again and then relax meanwhile your bugs eat your game unless it's in play. Then spend 2 times the hours you spent for coding, in troubleshooting code and bug finding. It could be even funny! Coding, it's all about you!!! History Salad is an idea completely developed and coded from two ex students of informatics science and tech-lover. We started with learning Unity3D’s general purpose. Then, after first step with the editor, we wanted to make something extraordinary, thanks to the power of itself. After many failed experiments and hundreds line of code thrown in the waste bin, we focused on making a 2D game never finished. 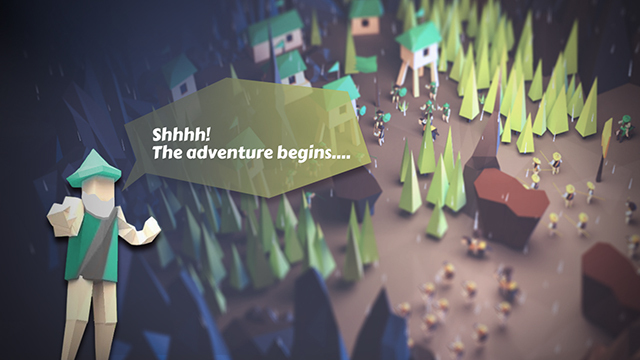 After initial discouragement, we felt in love with “low poly” graphical style, thanks to the infinite resources of the Assets Store. With the complicity of the new year eve spent in a medieval town near rome, History Salad project was born. We wanted to make a playable demo within 4 days, and now, after 4 months, we still have lots of bug hidden in every bush, but we are so proud of the work done until now. In the real life, both of us have work far away from game development, in fact the project move forwards very slowly. Our real dream, is to have, one day, a studio that makes fun for everyone.